Ophthalmology focuses on treating diseases and conditions that affect the anatomy and physiology of the eye. What this means is that an ophthalmologist takes care of surgical procedures, medical and routine care for your eyes. We are specialists in dealing with multiple eye diseases and conditions. Becoming an ophthalmologist requires a medical degree (M.D.) and completing residency like other branches of medicine. Some ophthalmologists can undergo additional training if they choose and focus on a specialty within the field. Ophthalmology training covers the entire spectrum of eye care. Ophthalmologists are trained to do thorough eye exams to prescribe glasses or contact lenses, offer medical treatment for an assortment of eye problems, and do complex and delicate eye surgeries for qualified candidates. They also take an active role in conducting scientific research on eye diseases and other serious vision problems. Ophthalmologists work to uncover causes behind these things and find cures. An ophthalmologist is a licensed medical doctor, so they are permitted to practice medicine and surgery. 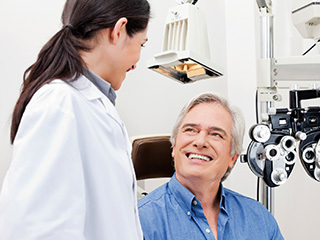 Ophthalmologists focuses on performing medical and routine eye exams, prescribing corrective lenses, and prescribing medications for certain eye diseases. The field of ophthalmology includes multiple sub-specialties where an ophthalmologist can focus on treating and curing specific types of eye problems. This can make it easier to address specific needs of patients.